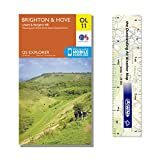 Buy OS Explorer Maps Online - Perfect for Hiking, Climbing, Walking. Ordnance Survey (OS) Explorer maps are at 1:25,000 scale, so every 4 cm on the map equals 1 km in the real world. They show the best detail including footpaths, rights of way, open access land and the vegetation on the land. This makes them ideal for walking, running, horse riding, off-road cycling and even kayaking and climbing. Combine these maps with a handheld GPS unit and high quality compass and you will be able to safely navigate the toughest terrain. Click on an image for more detailed information and the latest prices on new and nearly-new maps. 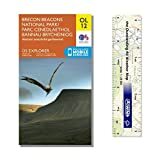 These South Downs maps are perfect for discovering the beauty of Southern England’s national park. Discover footpaths and viewpoints, tranquil locations and stunning coastal paths. The South Downs are criss-crossed with a maze of legal footpaths that can take you far away from the main South Downs Way (SDW) trail, which gets busy during summer months and sunny weekends. 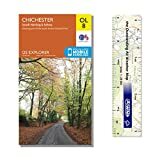 OS Explorer maps will help you get off the beaten track, safely and accurately. Click on an image for more detailed information and the latest prices on new and nearly-new maps. These Dartmoor, Devon maps are perfect for discovering the beauty of South West England’s national park. Discover legal footpaths and viewpoints, tranquil locations and stunning moorland tors. Essential for anyone considering a hiking or walking holiday on Dartmoor. 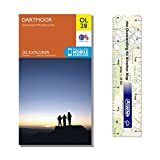 You can buy waterproof Dartmoor maps and also combined paper and digital download versions. Click on an image for more detailed information and the latest prices on new and nearly-new maps. These National Park maps are perfect for discovering the beauty of the UK’s national parks. Discover footpaths and viewpoints, tranquil locations and stunning mountain paths.